What a start to the year I’ve had. 2016 has started in an absolute blaze of glory with laughter so loud it would shake a house to its foundation and the most tender moments so gentle and loving they genuinely make you catch your breath. Last weekend I was back for the first time in a very long time to shoot a Nether Winchendon House Wedding with Gareth & Manju. The love these guys have for one another overflows with happiness and leaves you feeling all warm and fuzzy on the journey home. This year I’ve decided to blog as many full weddings as I possibly can, but also to bring you individual frames that I’ve loved as they happen and the story behind these moments. This moment right here took place immediately after Gareth had stepped off stage from giving a surprise rendition – and an incredibly soulful performance too I might add – of Gregory Porters Real Good Hands accompanied by the days four piece jazz band. By this stage the whole audience was tearing up, Manju was speechless and I found myself right in the middle of the action. This shot is a little scruffy compositionally, and initially I thought “oh damn, I’ve missed the kiss” but when I got home and saw this frame up on my screen it just kept tugging and tugging at my heart strings. These little in-between moments can speak volumes and are my out and out favourites. 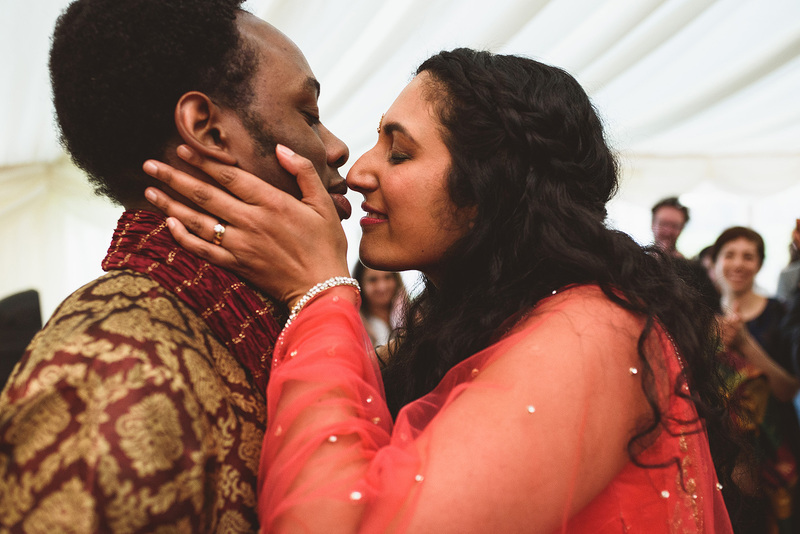 They’ll be more from Gareth & Manju’s Nether Winchendon House Wedding on the blog later this year!